In an unprecedented gesture of faith in a US-based nonprofit organization, Nepalese government officials recently invited Elephant Aid International (EAI) to create the country's first-ever chain-free corrals at Chitwan National Park where 63 working elephants now live—shackled in chains. The chained feet in the above photo belong to Asian elephant Man Kali. Born in the wild more than 50 years ago, she was captured as a baby, separated from her family, and sold into a life of service in Nepal. Like so many ‘working elephants’ throughout Asia, Man Kali has lived nearly all of her life in chains—a longstanding, traditional method of controlling movement during times when elephants are not working in the fields or forests, or on the busy streets of Asia’s crowded cities. Sadly, it is a practice that breaks both the body and the spirit of these highly intelligent, highly social, sentient animals. 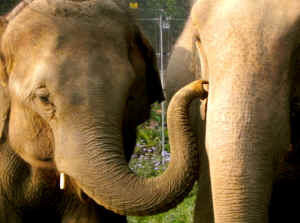 Now chain-free, Prakriti Kali caresses her mother, Man Kali, in their spacious new corral after years of separation. For Asia's elephants, life in captivity is filled with pain, isolation, and despair. Day after day, often with no shelter or vegetative cover from which to escape the sun’s burning rays, they stand for long hours shackled in heavy chains that prevent them from moving more than a few inches in any direction. Often stuck standing in their own waste, their feet become deformed and painful from infected and necrotic tissue. They develop crippling bone and joint conditions and exhibit abnormal rocking, bobbing, and swaying behaviors. Many die sick and broken. But life does not have to be this way for Asia’s working elephants. Change is possible…and it’s on its way in 2014. We need your help today! Step 1: Build 15 spacious, outdoor corrals using state-of-the-art, solar-powered electric fencing (virtually harmless to elephants). Step 2: Release 63 elephants from their chains (forever) and place them in their respective corrals, which include natural vegetation for shade and streams for bathing. Step 3: Witness the amazing transformation of formerly-chained elephants—their overwhelming joy of moving at will and engaging in natural behavior, such as dusting, foraging, sleeping, bathing, walking and playing! Please join us on this journey to change the lives of elephants by helping us raise $441,000 ($7,000 per elephant) by February 1, 2014. We are in a race against time to raise all funds and complete this project before the current Chief Warden of Chitwan National Park leaves office in 2015. With your generous support, 63 working elephants will finally be chain-free, forever… with many more to follow in the years ahead as a new tradition of compassionate elephant care takes roots throughout Nepal and beyond.